The situation for women in Iraq has become a "national crisis" since the US-led invasion in 2003, a report by an international women's group has warned. Women for Women International said they had had relative autonomy and security, but now faced violence, controversial leadership and poor infrastructure. Almost two-thirds of the 1,500 women questioned for the national survey said violence against them had increased. The report was issued ahead of International Women's Day on Saturday. 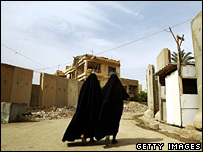 According to Women for Women's 2008 Iraq Report, shortly before the US-led invasion, "women's rights and gender equity were mentioned as symbolic issues for Iraq's new national agenda". "However, as the overall situation in Iraq began to deteriorate after the invasion, the focus on women was lost in the problems and violence facing the country as a whole," it said. "Present-day Iraq is plagued by insecurity, a lack of infrastructure and controversial leadership, transforming the situation for women from one of relative autonomy and security before the war into a national crisis," it added. A similar survey undertaken by the organisation in 2004 found that despite the fact that none of the women felt their families' most basic needs were entirely met, 90.6% were optimistic about the future. But in late 2007, the nationwide poll of 1,513 Iraqi women found only 26.9% continued to be optimistic about the situation in their country. According to the report, 63.9% or those questioned said violence against women was increasing. 68.3% described the availability of jobs as "bad"
"When asked why, respondents most commonly said that there is less respect for women's rights than before, that women are thought of as possessions, and that the economy has gotten worse," it said. Some 76.2% said girls in their families were forbidden from attending school, while 68.3% described the availability of jobs for women as "bad". More than 40% of did not think that the circumstances of women were being considered by those making decisions about Iraq's future. Iraq's new draft constitution, which has yet to be approved by parliament, contains an article under which family law would be replaced with a new system determined according to the religion or sect of those involved. "It has been five years since the American invasion of Iraq and while the mistakes made there continue to accumulate still no-one has stopped to listen to what this critical mass of the population, women, have to say about solving the problems," said Zainab Salbi, Women for Women's CEO.